Portsmouth, NH – It was the summer of 2015, and Hannah Blondin was walking the shoreline. 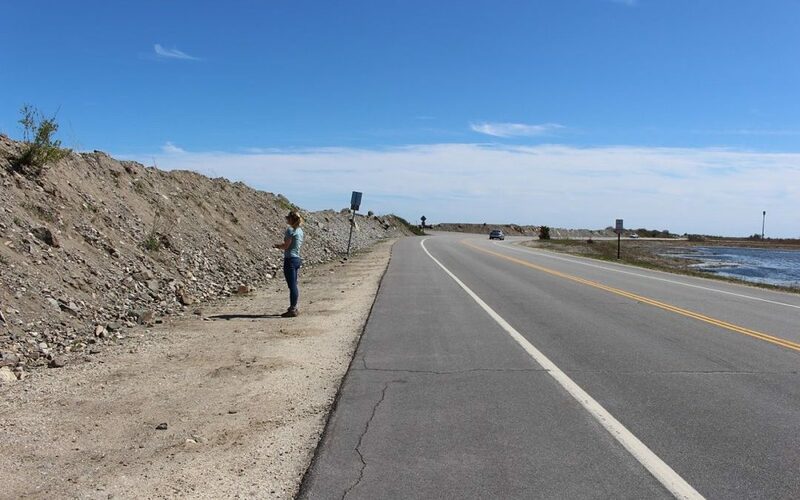 Find out what Hannah saw by jumping to our story map about the NH Inventory of Tidal Shoreline Protection Structures. What does NH’s Tidal Shoreline Actually Look Like? A new spatial dataset documenting the type of New Hampshire’s tidal shoreline protection structures along the state’s tidal shoreline is now available for download and viewing on the N.H. Coastal Viewer and NH Granit. New Hampshire Department of Environmental Services staff identified and digitized the location of rip rap, walls, berms, and jetties along 326 miles of tidally-influenced shoreline using aerial photography and field verification. This effort found that 12 percent of the New Hampshire shoreline is hardened by some type of engineered armoring structure. Coastal professionals can now use this dataset in shoreline vulnerability assessments, which will aid efforts to identify candidate sites for living or hybrid shoreline protection approaches that may better protect public safety in the state and sustain natural, economic, and cultural resources. Explore the Inventory on the NH Coastal Viewer. Read the Report. Hannah Blondin of the NHDES Coastal Program takes a hard look at the rip rap at Peirce Island in Portsmouth, NH.